See the MJM 35z in Miami and you’ll see the yacht offers a delicate balance of comfortable, all-weather accommodations and excellent performance in a single vessel. Two factors explain the achievement: MJM’s unique epoxy composite construction for a stronger, lighter and longer-lasting hull, and a sea-kindly, Zurn-designed, modified deep-V design with a greater waterline length-to-beam ratio of 3.5 to 1 versus the typical 2.7 or 3 to 1 ratio. 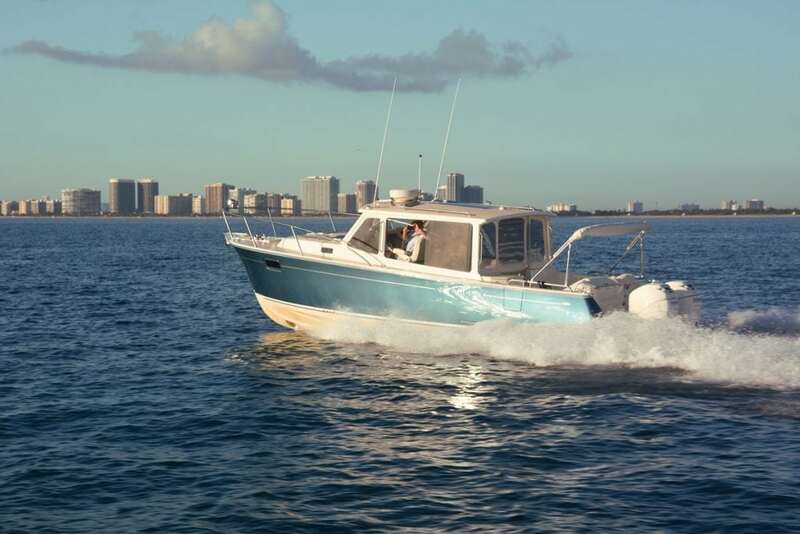 twin Mercury Verado 300-hp engines pushing her to 35 mph. Another plus includes comfort at speeds approaching the boat’s 50 mph top end. The 35z hull shape gains stability the faster it goes as lifting strakes and chine flats redirect wave and wake energy into effective stabilizing forces.